With the summer season drawing to a close, Isle of Man Railways once again organised the annual Island at War weekend, which attracted visitors to the steam railway – with events held at stations in Douglas, Castletown and Port Erin. 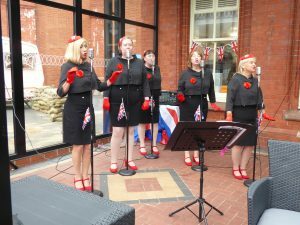 Including live acts such as the fabulous D-Day Darlings (as seen on Britain’s Got Talent) and the popular, Island based Southern Belles, there were plenty of opportunities to absorb the 1940s atmosphere along the route. There were also additional events including guided bus tours of war sites in Douglas with Charles Guard and two evening concerts with the aforementioned D-Day Darlings. Visitors were encouraged to dress up and join in the fun. 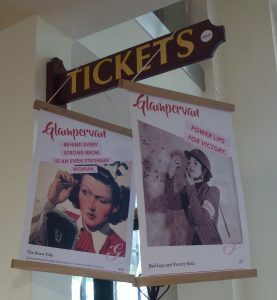 Each station offered something a little different, with a display of restored World War II military and period vehicles stationed in Douglas, together with the Glampervan, offering a 1940s make-up and hair transformation. 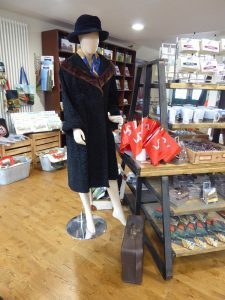 Here too was an evocative display of military uniforms and period costumes loaned courtesy of the Manx Amateur Drama Federation and curated by local artist Michael Starkey. And there was a treat for animal lovers with an opportunity to meet one of the Douglas Bay tram horses, who assisted in telling the wartime history of horses on the Isle of Man. Meanwhile, in Castletown, southern based scout troops set up a wartime camp and field hospital, as well as providing activities and cooking demonstrations. 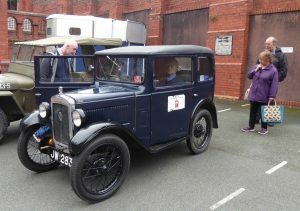 There was also chance to see a traction engine and steam roller and tuck into some home-made cake and light refreshments. At the end of the line in Port Erin there were plenty of goods from the WI stall and the Manx Craft Guild and a further opportunity to cast an eye over a selection of vintage vehicles. The Memorial Hall in Port Erin was transformed into a NAFFI café with exhibitions including an RAF 100 display.